This blog's purpose is to offer information about past and present Portuguese music, mostly -but not exclusively - classical/contemporary, its composers and performers, available written music and recordings. Born at the village of Pocariça, in central Portugal, on June the 17th, 1897, António Fragoso died of the pneumonic flu, on October the 13th, 1918. In spite of his premature death, he wrote a number of pieces for solo piano, songs and chamber music of such quality that, nowadays like in his time, it is believed by many he could have been the greatest Portuguese composer of the 20th century. He started taking piano lessons from his uncle but it was not until he was 17 years old that he moved to Lisbon to study at the National Conservatoire, namely with Marcos Garin, Tomás Borba and Luís de Freitas Branco. He graduated in only 4 years, with the highest classification on his piano exam. By that time, several of his works had already been premiered in concerts in Lisbon and other towns and were highly praised by the critics, as well as teachers and fellow composers. 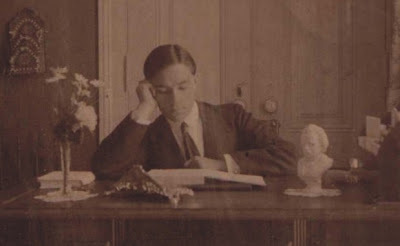 Notwithstanding his youth and notable influences by composers such as Chopin, Fauré and Debussy, his beautiful, melancholy music has an identity of its own, a good example of that being the "Petite Suite", the 7 preludes and the 2 Nocturnes, all for piano, and the song cycles "Poèmes Saturniens" (after Paul Verlaine's poems) and "Canções do Sol Poente". At the time of his passing, António Fragoso was working on his first sonata for violin and piano, of which only one movement was finished. Available scores (free): Nocturno, arr. Glenn Michael Egner; Petite Suite; 7 Preludes.